I’m back!! My family and I landed back in Canada 12 hours ago after a two week vacation in Hong Kong to witness the marriage of my brother in law, Vick, to his lovely bride, Kitty. Hong Kong is known as the least affordable real estate in the world it was fascinating to me to be able to witness it first hand. I know Hong Kong is not Canada, but as a real estate nerd, I’m always interested in how real estate markets behave for both sale and rent for ideas on how my tribe and I may invest to capitalize. For many of you listeners, you may recall the massive influx of Chinese immigrants from Hong Kong in the 90’s, and today it’s more the mandarin speaking folks. I hear it all the time from my friends in Vancouver and around Toronto. If you’ve spent any time in China, like Hong Kong, you’ll understand why, and it starts with prices. The condo I stayed at was only a few years old, on the suburban, terminal end of the train line to the north East. The GTA equivalent, this would be Barrie or Stouville. For a recent listing, the asking was just under $2,000,000 Canadian for…. Wait for it… almost 800 square feet, two bed, two bath apartment condo… Just think what $2,000,000 gets you in Canada. $2,000,000 gets you into a decent house West Vancouver, the most expensive neighbourhood in Canada. Another way to think about the price is per square foot, which is almost $2,500 per square foot. Compare that to 1 Bloor West in Toronto, which is one of the most premier, most expensive condos in Toronto priced at around $1,500 per square foot. Do you still wonder why we are seeing so much foreign investment from China? On the rent side, it’s not as crazy. This same condo rents for just over $3,000 per month. On the other hand, we have a family friend paying over $11,000 per month for her 1,100 square foot, ocean facing condo. Something to keep in mind as condo investing will become synonymous with single family home investing, condos with views will rent for above market prices. Canada sounds pretty cheap, doesn’t it? Affordability is a concern for every Canadian, just know how much better we have it than many. On a socialist front, 28% of Hong Kong’s population, or over 2,000,000 people, live in public housing. In comparison, Toronto Public Housing has just 164,000 tenants. Investment property financing requires 50% as down payment. Barbie is living the dream. No, there is no Ken or pink corvette, but she does what she wants with her time when she wants to. 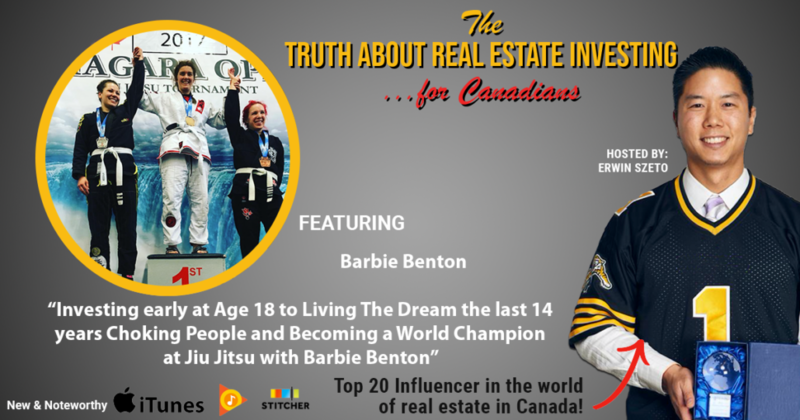 Barbie chooses to train and teach martial arts several times per day and she’s quite good at it, including having won at the Abu Dhabi Brazilian Jiu Jitsu World Championships. She is the first world champion I’ve had on this show, but she won’t be the last. Most of us have day jobs. Barbie’s day job is that of a self sponsored professional athlete, thanks to having started investing at the age of 18. 17 years later, that same property now makes up half of the income she earns today. Barbie shares about what it takes to be a world champion, what life is like as a successful investor, and her recent trip to China to start her ecommerce business. I’m just jealous she has fun all day and doesn’t have to work, AKA, living the dream.